LaGrange, Tennessee, in a mid-1970s view. Image by John Tackett/The Devoted Classicist. 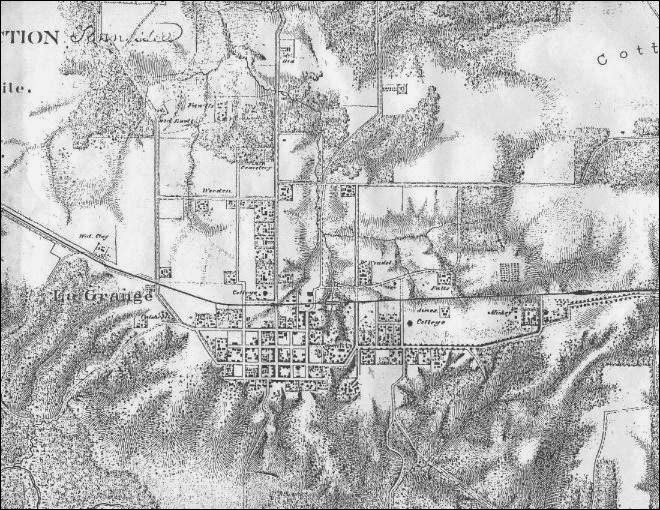 A map of LaGrange, Tennessee, 1862. U.S. Army Corp of Engineers. But by the time I was old enough to chauffeur my parents, I took advantage of the rule of The Driver's Perogative and would cruise slowly through the town and even detour to some of the side streets of LaGrange. Historic view of LaGrange, Tennessee. It is an area where early habitation has been documented. A few artifacts have been found dating back about 15,000 years when the land was still covered by the Pleistocene glacier. Many more artifacts have been found to show occupation during the Archaic Period that followed. The Chickasaw Nation, formed around the mid-1500s, was centered in towns in north Mississippi, and used what is now west Tennessee as hunting grounds. A trading post called Itey Uch La which meant "cluster of pines" occupied the site located on a high bluff above the Wolf River until the controversial purchase of the area in 1818 that relocated the Chickasaws to the West. The town of LaGrange, located in Fayette County, was named in honor of the home of the French hero of the Revolutionary War, Gilbert du Motier, Marquis de Lafayette. The town was surveyed in 1822 and laid out with 225 lots. A post office was established in 1828 and the town was chartered in 1829.
was built in 1832 just past the eastern border of the town. It served as General Sherman's headquarters in 1862. Also known as LaBelle Village, the town of over 2,000 occupants enjoyed prosperity before the Civil War. But over a three year period of occupation by as many as 30,000 Union troops almost devastated the town. Some of the houses were conscripted for official use and as many as 40 were partially dismantled for salvaged materials for the occupying troops. Economic depression prevented much building after the war, and a fire destroyed most of the west side of Main Street in 1873. The Yellow Fever Epidemic of 1878 also contributed to the lack of growth. The Cyclone (tornado) of 1900 wiped out most of the remaining commercial buildings which were never replaced, resulting in a lack of businesses. There are a couple of churches and a collection of handsome houses however. Photo by John Tackett/The Devoted Classicist. 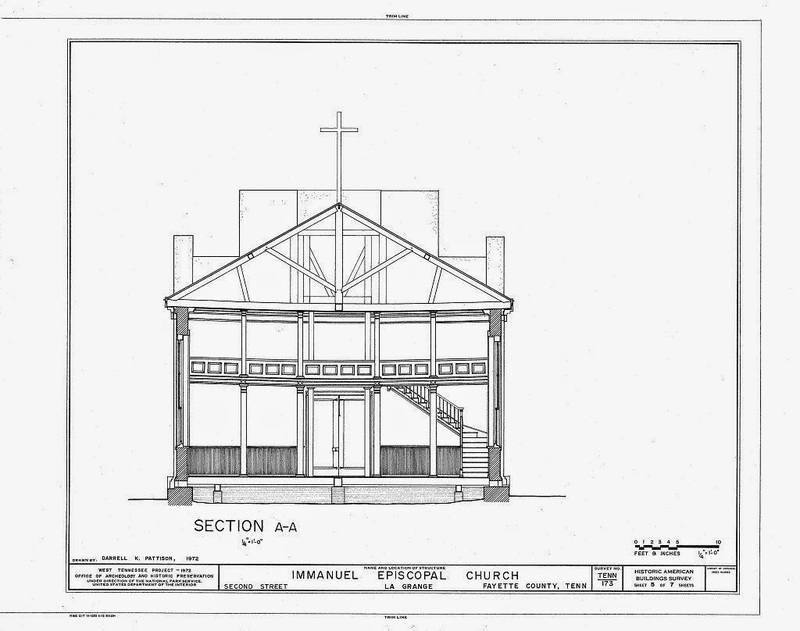 The most significant architectural survivor is Immanuel Episcopal Church. 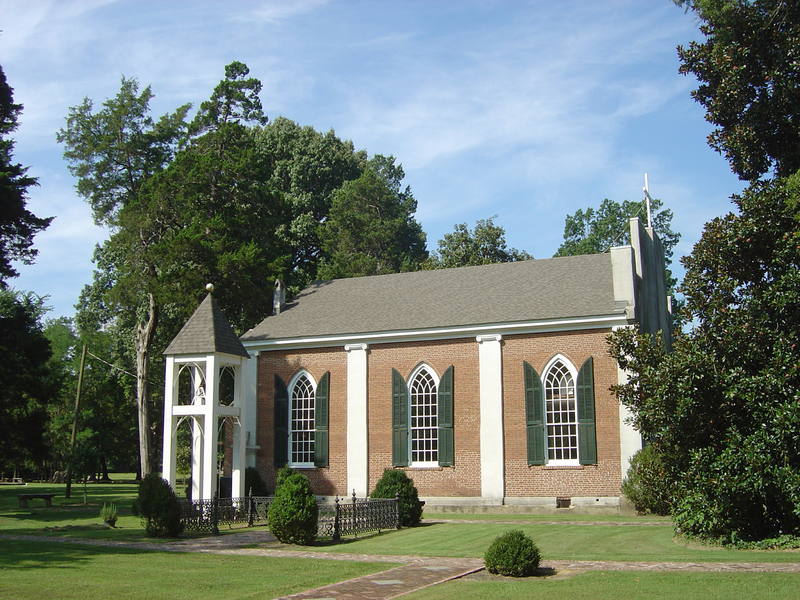 Organized in 1832 after a 52 year old widow, Mrs. Mary Hayes Willis Gloster, rode horseback with her son-in-law to Franklin, Tennessee, to seek help from her godson, Reverend James Hervey Otey, later to become the first Bishop of Tennessee, as there were no churches in the area of LaGrange. 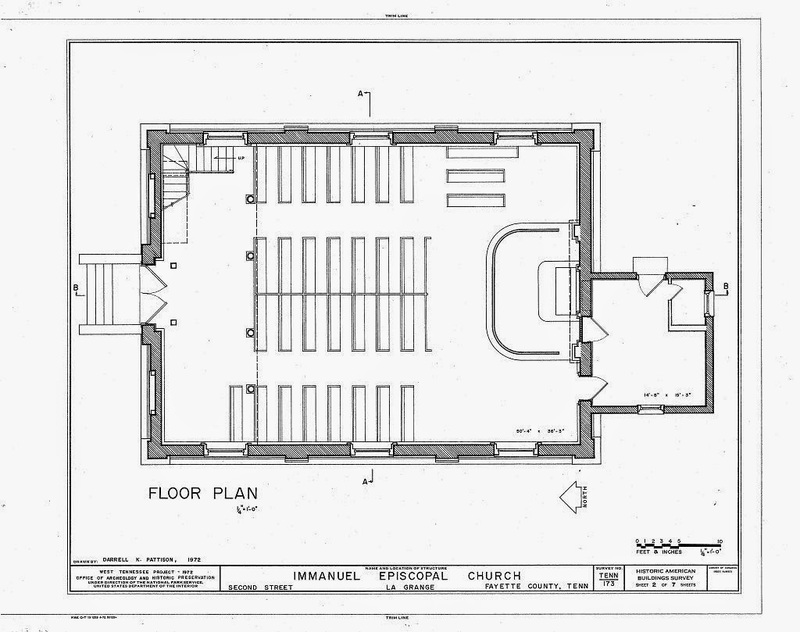 The floor plan of Immanuel Episcopal Church. Built by slaves, the cornerstone was laid May 9, 1840, and consecrated for worship in 1843. Although no architect was credited, it is a handsome building, especially considering the relative isolation. (The railroad passing through the town, linking Charleston and Memphis, the Atlantic Ocean to the Mississippi River, was completed in 1857. 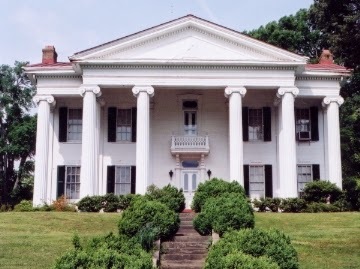 See an earlier post of The Devoted Classicist for the nearby town of Holly Springs, Mississippi which prospered from a link to the railroad at the adjacent town of Grand Junction). 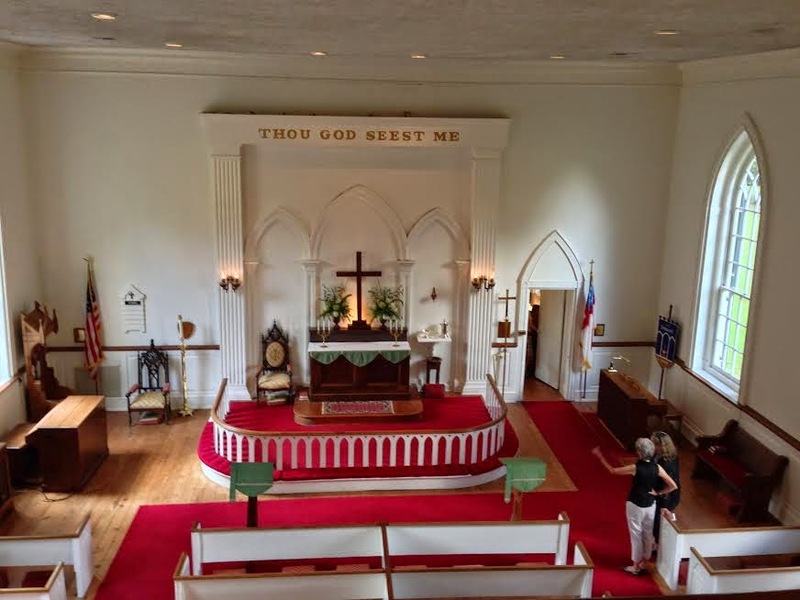 The church is said to be a closely inspired by the Gloster family's former Immanuel Church in Warrenton, North Carolina. The front of the church is austere, with only the double doors flanked by shallow niches, more like blind windows. 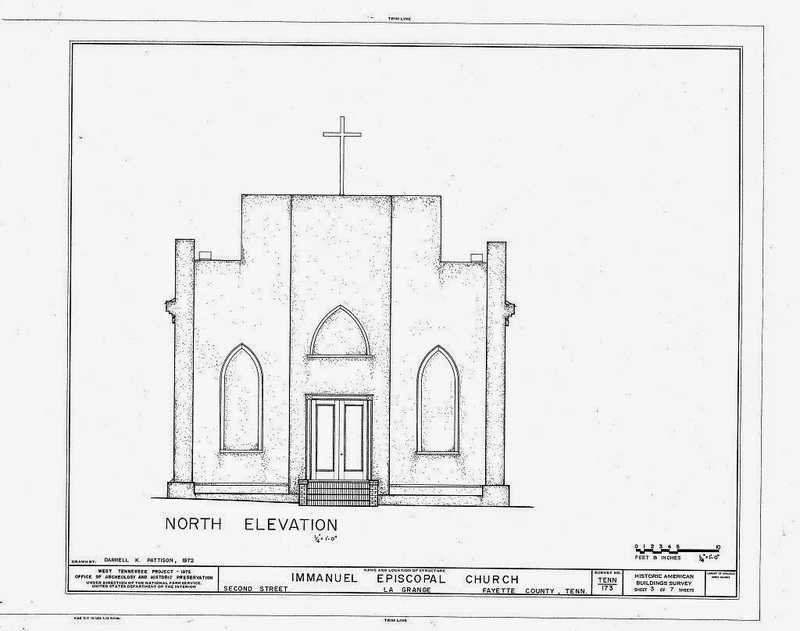 There was to be a belfry, and the original hand-hewn structural framing shows this intention, but it was never built. 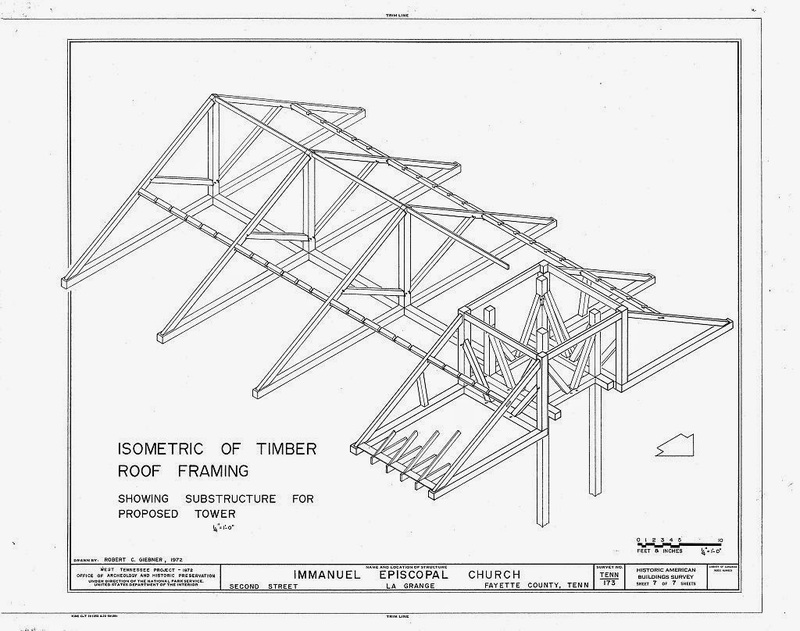 The roof framing of Immanuel Episcopal Church. There was a campaign in the nineteen-teens that raised money to add a belfry tower, but it was decided to donate the funds, instead, to support charitable efforts related to the Great War (World War I). In the 1970s, an abstract bell tower was built adjacent but separate from the building. showing the 1970s bell tower adjacent. The sides of the church are more attractive than the front, however. The hand-made brick laid in Flemish bond provide a handsome background for stucco-covered, simple pilasters, long gothick ogee-head windows and louvered shutters. (The existing window sash date from a 1968 restoration; they are similar to, but not an exact match of, the original). window sash at Immanuel Episcopal Church. Inside, the sanctuary measures 50'-4" x 36'-3" with the original 20'-2" ceiling height restored after the removal of a late 19th century vaulted wood ceiling. A balcony spans the front end of the space, one of the few slave galleries ever built in this region. 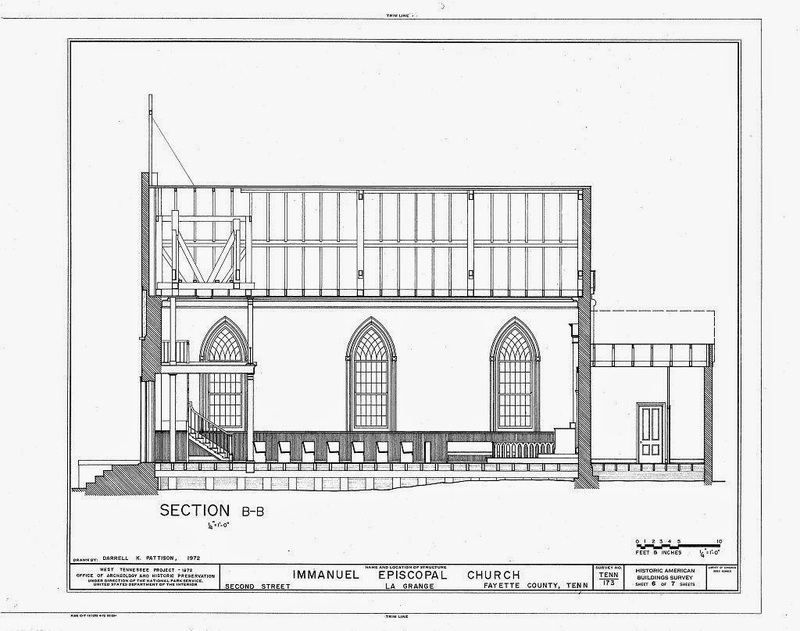 East-West Section through Immanuel Episcopal Church. 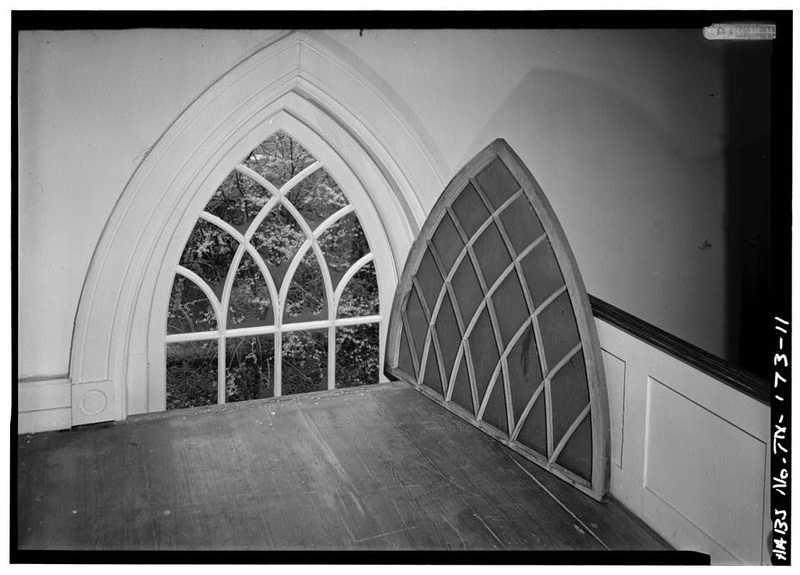 showing the original window sash. 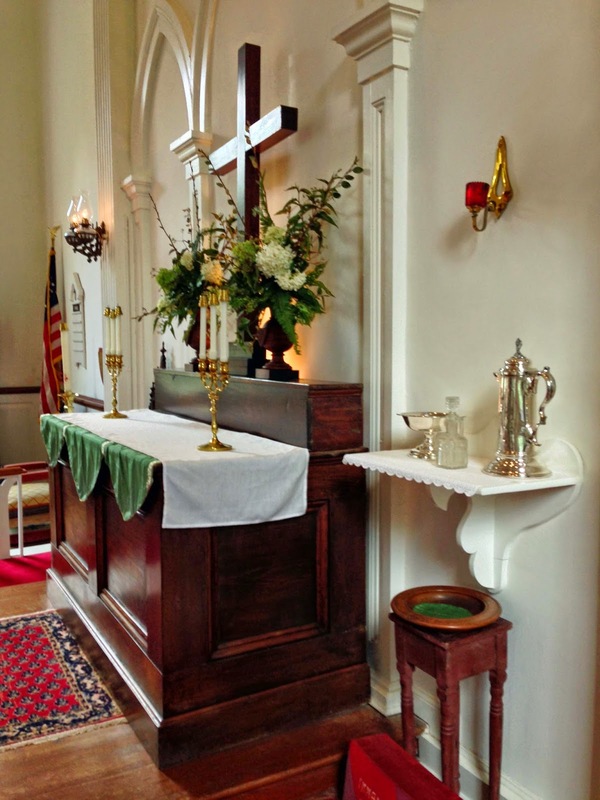 At the other end, the original mahogany cross which had been removed for safe-keeping during the Civil War, has been returned to its intended location above the alter. The original cruets are placed on a shelf adjacent. View to the alter from the gallery. During the Yankee occupation, the church was used first as a hospital, then as a warehouse. 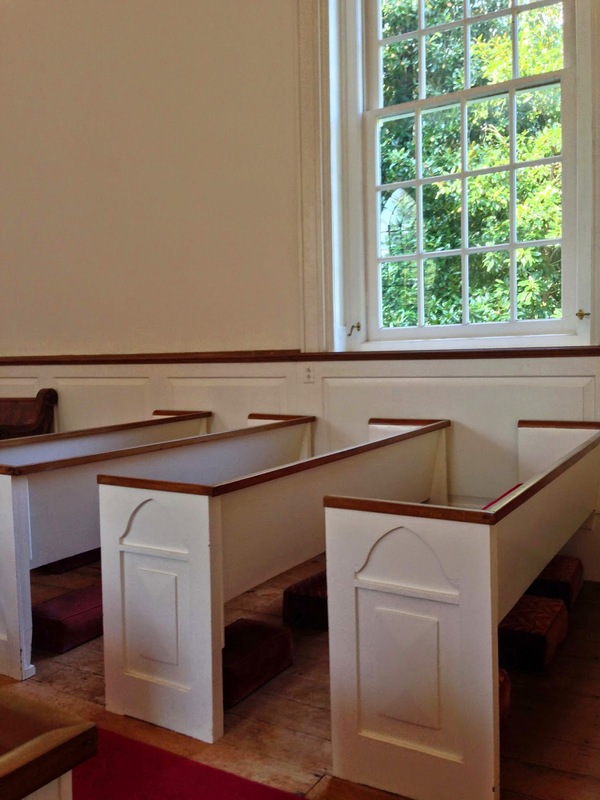 The pews were removed and, according to written accounts, the wood was used for coffins. The wainscot was burned as firewood. The replacements are said to approximate the design of the original. The flooring of pine boards 7 1/4" to 7 1/2" wide is original. The Vestry was replaced after the Civil War. A half-bath was added in the 1968 restoration. Central heating and air-conditioning was added at that time as well. In September, I had the opportunity to visit Immanuel Episcopal Church with three sisters from St. Mary's Convent, an Episcopal Benedictine monastery for women in Sewanee, Tennessee, and a contingent from St. Mary's Episcopal Cathedral, Memphis. It was part of an annual observance each year honoring Constance and Her Companions, the Martyrs of Memphis. We were given a history of the church by its most gracious warden, Nora Whitmer, the source for much of this information. Afterwards, we were fortunate to be invited to visit the warden's home, Cedar Hall, surely the most charming in a village of lovely homes. The small cottage dating from about 1831 was sensitively enlarged with additions flanking either side of the original, plus an extension to the rear that also provided a wrap-around porch. For those considering an outing, there are currently no commercial establishments in LaGrange. However, a no-frills meal can be had at Junction Café about 8 miles to the east on Highway 57 W in Grand Junction. Unfortunately, their specialty, BBQ, was not available at the time of our visit, but comes highly recommended. For more information on LaGrange, visit the town's website, a reference used for this essay. An honorable posting, very glad I saw it. Thank you, Laurent. Your thoughtful comments are always appreciated. Why was the Episcopal Church built by slaves (in 1840) do you think, and was the Church morally comfortable with that situation? I am guessing that the slaves were selected for their cheap labour, not for their skills in architecture and interiors. As this is not a social commentary blog, I hesitated and considered not adding "built by slaves." But I abhor revisionist history, putting a slant to make the past artificially more positive or negative, and/or just ignoring something altogether. In this area of especially large plantations, arguably at the edge of the frontier at the time, there was a large slave work force for manual labor so it would not have been uncommon for the members of the church with these resources to donate this labor for the community cause. My guess is that it was a decision based on local mores at the time. 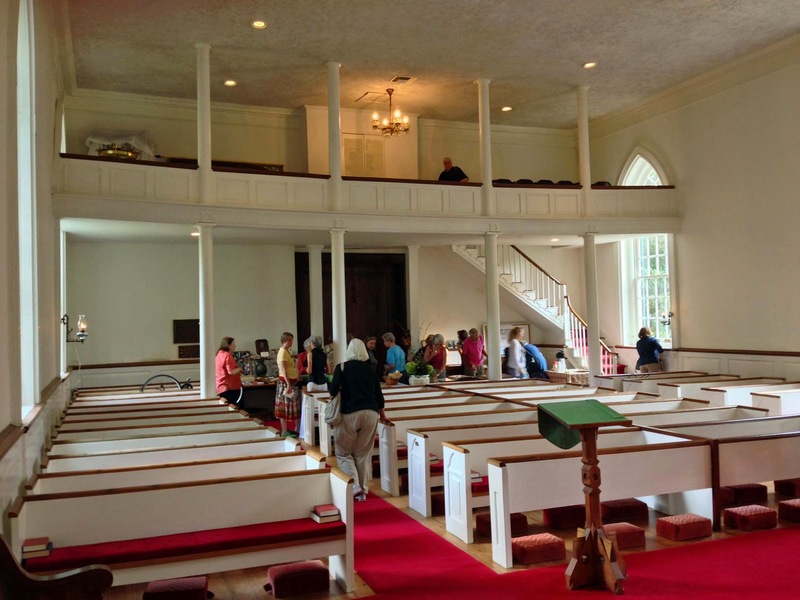 Although the races were segregated with the main floor vs. gallery, it was a relatively uncommon practice for them to worship together in the same building at the same time, again considering the time and location. This is all just my opinion, of course. Thanks for commenting. I also abhor revisionist history. It deprives later generations any understanding of what went before. It is easy to criticize from here.....about there......two hundred years ago.....or even 60! Let's get on with it...tell the truth....give credit where due......and go visit all the beautiful villages in the South!! Soon!!! Not the usual.....but ones like this!! Who knew there were Episcopal nuns???? I have been an Episcopal since birth (I even taught Sunday school all through college); never even heard of an Episcopal nun! A beautiful church; a beautiful house; and a little bit of heaven right there in the middle of "LaGrange"! Penelope, although I suppose the more accurate term is "sister," "nun" is frequently used. There are fewer and fewer, however; when these are gone, that may be the last here in Tennessee. If you have not clicked on the link for Constance and Her Companions, I think you would enjoy reading that history. Thanks for commenting. I got in to USC on probation......and got all A's at USC thanks to those "sisters". In school we called them "Sister Mary"; but they were defintely called "nuns" I am fascinated.....Episcopal nuns were different!? You don't have to answer this....were they allowed to get married??? Fascinating....never heard of an Episcopal nun! Now women are allowed to be Episcopal Priests and Bishops! I actually demonstrated peacefully about that in the early 70's! I wore a badge....tee hee. Not much of a demonstator! I love your blog!!! Thank you! I am going on a tour....Charlston.....Savannah....and then your vicinity......there are true treasures there!! P.S. So many parts of the South are so civilized. They don't get enough press! Thank you again!!! 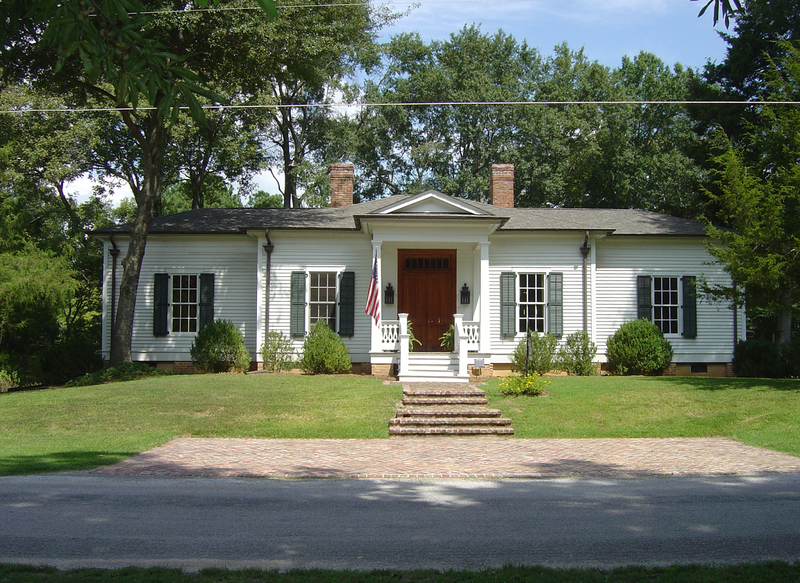 Yes, there are many beautiful small towns in the South where gorgeous historic houses can still be bought at great prices - if you can live a little more than an hour away from a major airport or gourmet market. Yes, Dean. There is a whole passel of them! Thanks for commenting. Lovely church and as you say, the sides are much more attractive than the unusual front. Thank you for commenting, Stefan. The church's facade puts me in mind of St. Paul's, an Episcopal church in Alexandria, Virginia. As for slave labor, that was the way of things in America at the time and needs to be viewed through an early nineteenth-century lens. Some slaves were highly trained and skilled in carpentry, blacksmithing, etc. There is another church in Alexandria, Christ Church, that was not segregated. George Washington, for example, took house slaves to church and they sat in the pew with the family. Slaves/freedmen would be baptized and confirmed if they so wished. By the 1840s 10 percent of the congregation was black. They knelt at the chancel rail beside white members. It wasn't until after ratification of the 13th Amendment that the black members asked the Episcopal Church if they could have their own church. The Church said of course, and one of R.E. 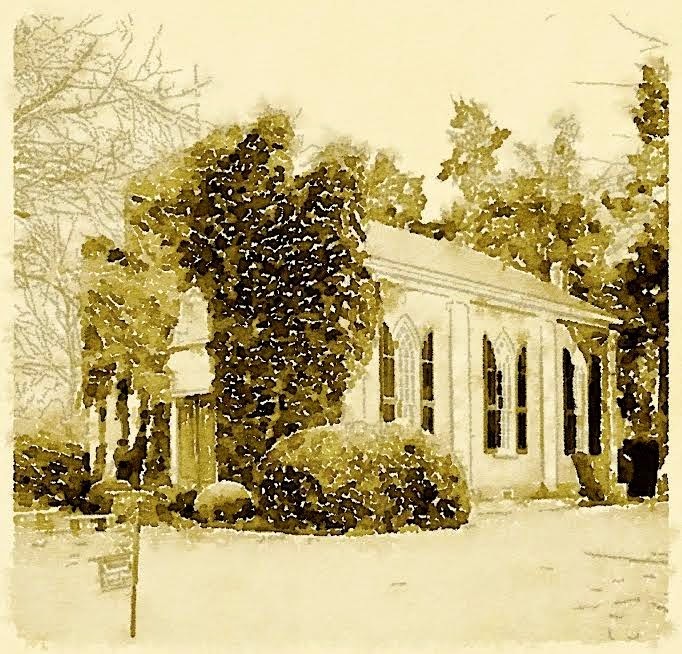 Lee's aunts took up a collection and Meade Chapel was built. (It was named after Wm. Meade, the rector of Christ Church when Lee was a little boy, his uncle, a bishop of Virginia, and the founder of VTS.) 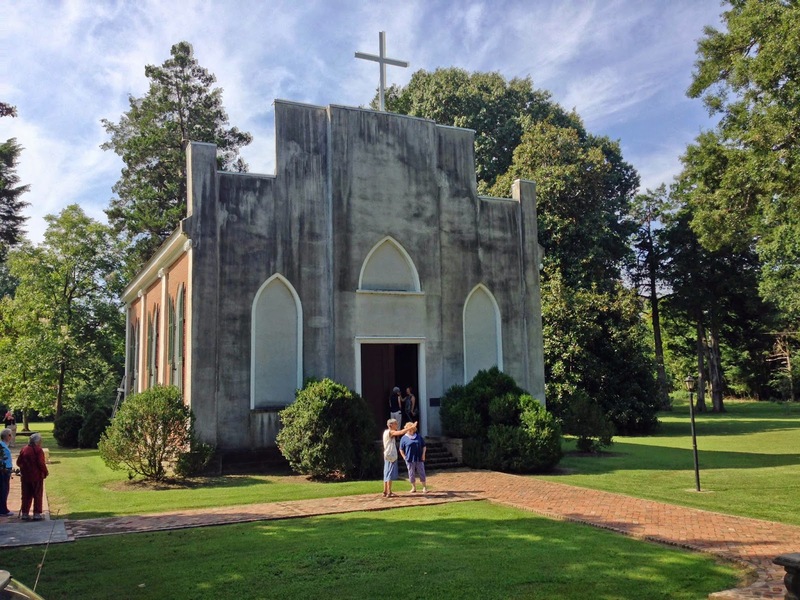 The Meade church continues and has members who are fiercely proud to be direct descendants of some of Martha Dandridge Cusis Washington's 150-plus dower slaves. Thank you, Janet, for your informative comments. I stumbled upon this and am so glad that I did! 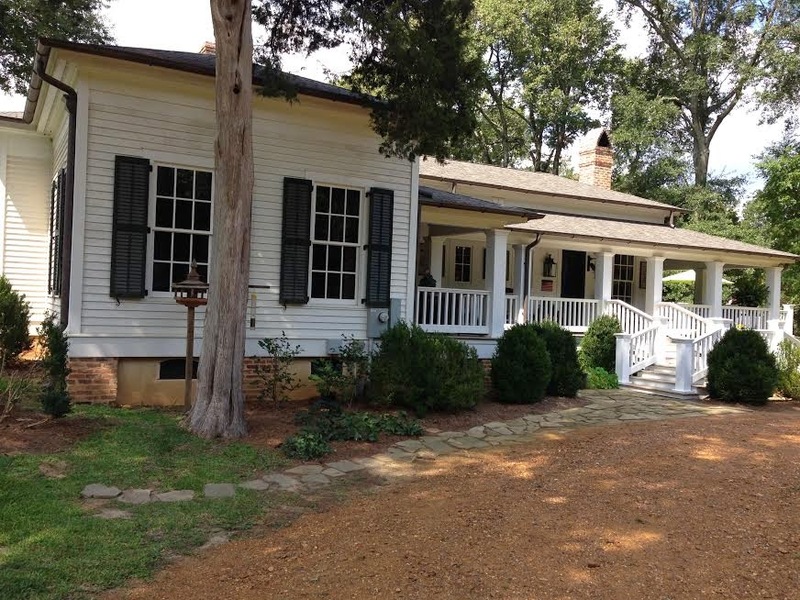 My parents live in LaGrange and I have loved visiting this special place on many occasions. My brother was actually confirmed at Immanuel and I have had the opportunity to attend worship services there with a group of lovely townspeople. Nora and Walley Whitmer are both amazing people. The house they lived in prior to this one was beautiful as well. They used to run a bed and breakfast that was delightful. Thanks for a most enjoyable read! I am glad you found TDC, Marsha, and hope you will become a Devoted Reader. Thank you for commenting.